When author-illustrator Lita Judge discovered hundreds of tracings of feet in her grandparents' attic, she was intrigued. Once she learned the story behind them, she was inspired to share it. In the aftermath of World War II, many Europeans were left homeless and starving. This is the story of one Midwest family's triumphant effort to relieve their suffering. They sent packages of food, clothing and shoes to pre-war friends in Germany, as well as offered help to others. Soon shoe tracings from all over the continent started pouring in to Hamerstrom's modest farm. With so many in need, the family enlisted the help of American friends and their neighbors. Ultimately, thousands of people on both sides of the Atlantic were touched by this remarkable process. Illustrated with a combination of painting and collages of original photographs and foot tracings, this moving story is a granddaughter’s tender tribute to her grandparents who organized this relief effort. By sending hope and kindness, they began healing the wounds of war. It is a powerful reminder of the importance of humanitarianism during wartime. When I was cleaning out my grandmother’s attic after her death, I found a dusty box stuffed with aged, yellowed envelopes. I was intrigued when I lifted out the first envelope, as it had a German stamp postmarked 1947 and inside were two paper foot tracings. The next envelope also contained foot tracings--and the next and the next. Some were cut out in the shape of feet, others were drawn on paper, tracing the outline of an entire family’s feet, the littlest in the center with larger tracings growing outward like rings on a tree stump. Mom held the tracings like treasured belongings. “We searched everywhere to find shoes for them all” she said. She remembered piles of shoes when she was a little girl, and boxes filled with clothes and food to send to people starving in Europe after World War II. She remembered they sent soap and candles too, even toys and sweets for the children. And they knitted socks to fill the shoes they sent. I was confused. Why had I never been told about this? Why had Grandmother never talked about the people she had helped? Mom and I looked through the envelopes together. There were hundreds of envelopes and tracings. There were also letters requesting help. Some were in German with translated copies clipped to them. Others were in broken English. They all indicated the desperate need for food and clothing. These letters told heart-wrenching stories of how people had lost their homes, their belongings, and that their children were dying of starvation and disease. One woman wrote lovingly of her husband and five children, but said only one child was still alive. At the bottom of her letter she wrote “any little thing you could send would be helpful.” There were scraps of paper with lists of food and clothing clipped to the envelopes. The date was written on the top of each list in my grandmother’s handwriting. She must have kept track of what each family received this way. My favorite discoveries were the thank you letters a few of the envelopes revealed. Some included pictures of the European families, especially their children. The letters expressed deep gratitude, but also told how the packages gave them hope after the despair of war. I read over and over how the kindness that came with each package was as important as the urgently needed food and clothing. I held the tracings and realized each one represented a real person who had been helped by my grandparents. I began to realize Grandmother had fought her own war in the aftermath of World War II. She fought to bring hope and healing to people faced with the devastation of the war. I looked again at the pictures of the children and was overwhelmed by each face smiling back at me. I knew immediately I had to find out more, to uncover details about how my grandparents had accomplished this huge effort. My grandparents were gone, so I could no longer ask them about the relief effort. Mom was a young child during those years and could remember only a few details. I needed to uncover the truth. 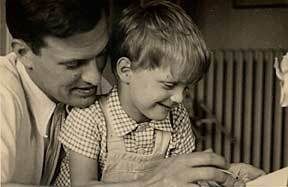 When I returned home, I began searching for clues to my grandparents’ lives after the war. Mom had remembered that they called their relief effort The Action. My grandparents were ornithologists, so I searched in scientific journals from the mid forties and found bulletins where they had advertised for volunteers to help with the relief effort. I found names of volunteers and even talked to a couple who were still alive. The volunteers were mostly American biologists and ornithologists who banded together to help Europeans biologists starving after the war. One of the American biologists had written her memoirs and included a chapter about The Action. She credited my grandparents for organizing the relief effort and wrote how hard my grandmother struggled to find American families to adopt European families, how she kept track of everything sent to make sure people got what they needed, and how she took on the burden of finding shoes for everyone. By banding together, the American ornithologists and biologists sent over 3000 packages to people from 13 countries. I even found a few of the European survivors. Some still lived in Germany and Italy, others had moved to America. One woman, who was a small child during the time, gave me copies of dozens of letters my grandmother had sent to her father during The Action. She had kept them all these years. The letters revealed how much my grandmother cared for the people she was helping though she had never met them. At times I could read her anxiety over whether she could find enough clothing and shoes for everyone and apologized she couldn’t do more. I began to realize how many sacrifices she and my grandfather made during those years. I traveled to visit a survivor now in her late 80’s. She told me her child was so hungry during that time that her belly was swollen from malnutrition and she almost died from typhus fever. She told me they had only rags to wear and how bitterly cold those winters after the war were. “Having shoes and a new dress meant I could get a job” she told me. She laughed at the peanut butter she received. “We had never seen peanut butter. But it was good and had a lot of fat, which mattered most.” Every survivor I found remembered the packages and spoke of my grandparents with great fondness. They were thankful for the kindness and friendship after so much desolation and pain. And they all talked of the hope – that precious commodity - the packages gave them. Why had my grandmother had never talked about The Action? I discovered she had been unable to save one of the people she loved most in the world – Frauta - her childhood governess. Frauta had moved back to Germany before the war. Grandmother received a heartbreaking letter from Frauta and sent packages of food and clothing to her immediately. But Frauta died before the package got to her. I think my grandmother never got over the loss, but I also think it’s what made her driven to help so many others. I couldn’t get the pictures of the children my grandparents had helped out of my mind. Their faces smiled at me from tiny black and white photos 60 years after they were taken. I knew I wanted to share this remarkable story with other children. My mother and I had found the foot tracings together, and I wanted to tell the story of how she and her mother had worked so hard to help people. For this reason, I wrote a picture book and titled it One Thousand Tracings, after all the foot tracings I discovered in that dusty, tattered box. My grandmother would have turned 100 years old this year, the same year my book is published. I wish my grandmother could have shared these memories with me, but I feel closer to her now for having discovered the truth. I wish I had known about it when she was alive so I could tell her how proud I am. Instead, I wrote my book as a tribute to her. I hope any grandparent who reads One Thousand Tracings to their grandchildren will share their own family stories with their children and grandchildren. They will cherish those memories. Note: This story was to appear in Plus Magazine in September 2007. 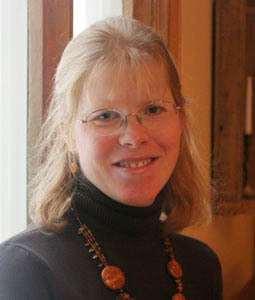 Lita Judge was born in Alaska and grew up in several remote areas of the West. As a child she spent quiet hours watching and photographing wildlife with her parents. Every summer she lived with her grandparents, who were ornithologists and shared their home with eagles, hawks and owls. She learned to raise baby birds and care for injured wildlife. She also loved to draw these animals. Lita studies geology in school and dug for dinosaurs in Canada before returning to her first love, writing and illustrating. Her childhood interests in science, history and nature continue to inspire her art. 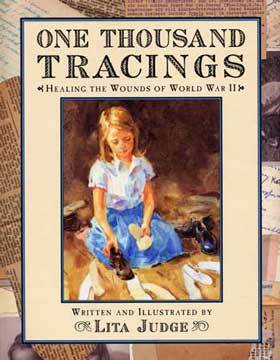 One Thousand Tracings is Lita's first picture book. She lives with her husband and cat in Petersborough/New Hampshire. More information about Lita and the relief effort described in this story can be found at Lita Judge's website.